Flavor the chicken with spices and fry it with olive oil in a medium heat for 5 minutes. Remove the chicken from the pan and add the cooking cream, lemon juice, dried peppercorn and a pinch of salt and pepper. Leave the ingredients to soak for 5 minutes at medium temperature. Boil the farfalle in lightly salted water for 11-12 minutes and add them to the sauce in the pan. If the sauce is too thick – add water to the pasta, if it is too watery – cover the dish with a lid for 5 minutes. Sprinkle with parmesan, a pinch of salt and pepper, and stir well. 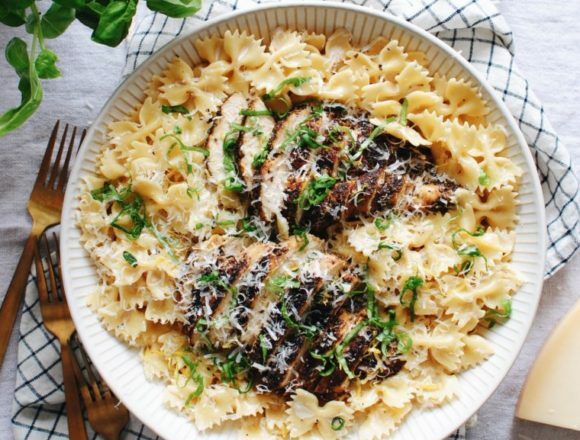 When serving, place the breasts, the basil, the parmesan and several slices of lemon on top. Enjoy your meal!